With all the exceptional street food, pop-up ventures and ethnic eateries, Hackney’s gastronomes are hardly a neglected bunch. But we can always become even more spoilt for choice, as two exciting new ventures prove. Most recently, the Open Kitchen in Hoxton hosted the trial run of the Honey Drizzle cooking school. 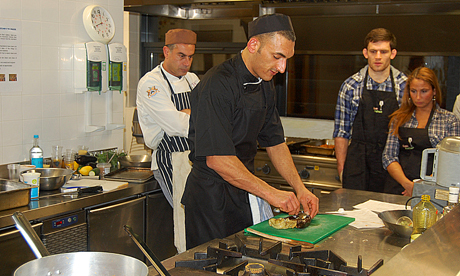 Set in the restaurant’s spacious, professional-standard teaching kitchen, the enterprise is led by Hyson Khalid, a Cordon Bleu chef who has worked in the kitchens of Jamie Oliver and Gordon Ramsay. The twist is that Khalid is also a fully qualified personal trainer who combines gourmet cooking lessons with fitness and weight loss advice. Judging by the opening night, there is no reason why Honey Drizzle should not become a success: the facilities are excellent and Khalid is an engaging personality who caters to all ability levels with gusto. Relative novices would not be intimidated by his approachable menu, which featured cumin-spiced chicken with fruity couscous and baba ghanoush on the night, while more experienced amateur cooks will obviously benefit from working closely with such a skilled professional. Launching in full later in the spring, it’s certainly one to watch out for as we try to get in shape for the summer.